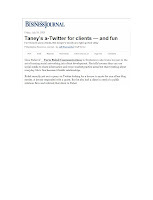 Philadelphia Business Journal's Jeff Blumenthal reported today on the use of Twitter for Lawyers. Like our "image"? A bit small but it will do for 5:30 on a Friday.... at least Gina "said it's okay." In fact, Gina Rubel, the CEO of Furia Rubel Communications, is quoted by Jeff regarding how lawyers can use social media for business development. Gina even provides a great example of how social media has led to a new public relations client for our firm. You can read the article if you're a subscriber to The Philadelphia Business Journal at http://philadelphia.bizjournals.com/philadelphia/stories/2009/07/27/story1.html. And if you're not already a subscriber, what are you waiting for? !